“Leveraging over 10 years of industry experience, we were able to provide Martignetti with a customized solution that meets their unique needs and business goals." 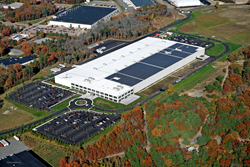 Beaumont Solar, a leading, full-service solar developer and Engineering, Procurement & Construction (EPC) company, announced today the successful completion of a 2.2 MW DC rooftop solar PV system at the new Martignetti Companies LEED certified facility in Taunton, MA. The collaboration resulted in the efficient and timely completion of the company’s new headquarters. Due to the regulatory complexity and tight program deadlines, the project involved working closely with the MA Department of Energy Resources (DOER) to ensure eligibility under the Solar Renewable Energy Certificate (SRECII) program, assurance of interconnection and negotiation of net metering with the Taunton Municipal Light and Power (TMLP) Transmission & Distribution teams, and the Department of Public Utilities (DPU) MASS System of Assurance of Net Metering Eligibility (MassACA), before construction commenced. Martignetti’s 680,305 square foot building accommodated 7,030 solar modules that will generate approximately 2,596 MWh. With net metering secured, this means that the company is not paying higher energy rates for consumption during non-production hours. As corporations look at ways to better manage energy costs, deploying solar has become an attractive investment vehicle that can provide financial stability, quick ROI, as well as decreasing tax liability, and a boost to the bottom line. With various financing options available, off-taker power agreements and regulatory incentives, it has never been easier or more economically feasible to deploy solar. Solar is no longer a feel-good corporate program, but a proven financial vehicle to stabilize energy costs providing significant competitive advantage. Beaumont has deployed over 200 solar projects with over 35 MW of power for commercial, industrial and municipal customers harnessing the value of sunlight – providing the affordable, fixed rate energy to power their offices, factories, schools, hospitals and more. Beaumont is known for providing best in class technologies backed by our unmatched capabilities to design and construct highly advanced solar systems on landfills, carports, rooftops and ground arrays for streamlined, reliable, cost-effective renewable energy solutions. Beaumont manages the entire project in-house, providing our customer an integrated, full-service approach. Beaumont Solar is a leading, full-service solar developer and Engineering, Procurement & Construction (EPC) company. We specialize in the development, design, building and long-term operation & maintenance (O&M) of solar systems in the commercial & industrial (C&I), utility, agriculture and public sectors. With a long history dating back to 1918, we have the experience, infrastructure and expertise to help maximize the value of underutilized assets (rooftop, carport, landfills, hazmat sites, and land). We help structure financing; both debt and tax equity, provide off-taker power agreements and ground or rooftop leases and determine site feasibility. Beaumont works closely with customers to help them meet financial, energy and sustainability goals by identifying the most efficient systems and cost effective financing. With offices in MA, RI, and NJ, we provide installation and support across the USA. To learn more, please visit http://www.beaumontsolarco.com/. Or meet up with Phil Cavallo, President & CEO of Beaumont Solar and other company executives directly at Solar Power Northeast being held at the Westin Boston Waterfront Hotel, February 13-14, 2017.